Before 2009, the Archives of Ontario had been housed in five different locations. Remarkably, not one of them provided an exhibit space. This became a must-have when a sixth location was sought in 2006. Now onsite exhibits can be created regularly to showcase the Archives’ many rich and varied collections. This requires investing significant amounts of time and thought into the design of each new exhibit. Because when it comes to creating an exhibit, there are no instructions, no templates, no cheat sheets – nothing but a blank canvas awaiting an imprint from the myriad possibilities that the imagination can conceive. This was the case for the World War I exhibit, particularly since it was the first exhibit of archival materials to be curated in-house. In a previous blog, I spoke about our novel approach to the immense and complex subject matter that is the First World War. Exhibits frequently present raw military footage, images of scarred battlefields and shots of beaming generals. However, the Archives of Ontario is not concerned with reconstructing battles or highlighting military records. Moreover, our field of endeavour is limited to events and actors with roots in Ontario. So the exhibit is not a paean to the glories of war, nor does it dwell on the brutalities of battle. Rather, visitors to the Archives’ onsite exhibit will see the conflict from a distinctly human and personal point of view. They will be immersed in the lives of four ordinary Ontarians whom the war affected in differing ways – an experience made possible thanks to their personal writings, which are part of the Archives’ collections. The reminiscences of a private in the trenches; the correspondence of a surgeon in a field hospital; the love letters between a pilot and his beloved: these make the war come alive in a way that shifting flags on a map cannot. Nevertheless, the pervading feeling needed to be immediate and immersive, direct and dramatic. The war was staggering in its impact, and so we wanted to go big – life-size or larger. Numerous smaller panels were eschewed in favour of imagery that stretches from floor to ceiling and running the length of entire walls. The images and quotations selected are meant to provoke visceral reactions, and yet most are of very ordinary individuals who beckon us into the intimacy of their thoughts and experiences. 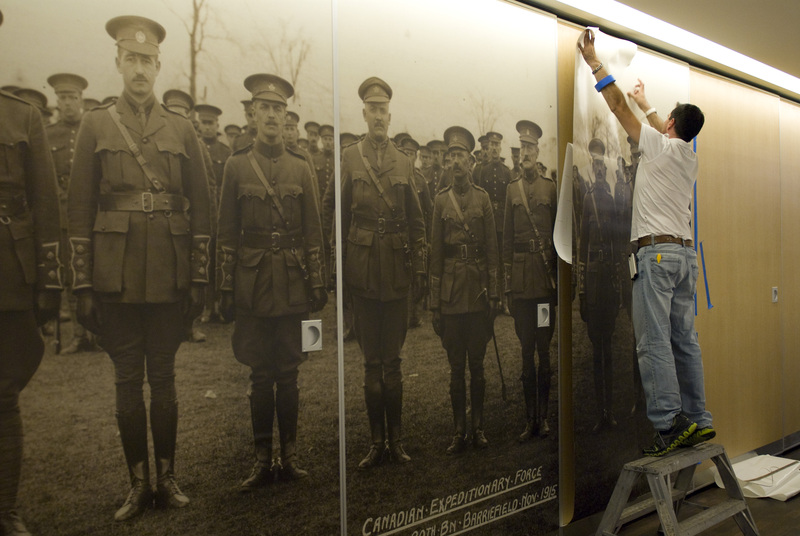 One wall of the exhibit space is dedicated to amateur footage of the unveiling of the Vimy Memorial in 1936. This silent witness to the great hope for an enduring peace just three years before the outbreak of World War II is a poignant complement to the exhibit. Seating has been provided to encourage visitors to pause and quietly reflect upon the immense sacrifices that were made – and the profound desire for peace that was expressed as a result. In this way, we hope to make the exhibit an opportunity for active “remembrance” – in keeping with its title – rather than a simple occasion for accumulating knowledge. In terms of organization, the exhibit is composed of four principal parts. Each of the three “stories” – of Private John Mould, Dr. L. Bruce Robertson, and Sadie Arbuckle and Lieutenant Harry Mason – was assigned a distinguishing background colour. Complementing these sections are a number of artefacts, including a prosthetic leg, cap badges, a writing set and medical kits. A timeline was also created that would place significant moments in these individuals’ lives alongside the important events of WWI. A fourth, contextual element completes the exhibit. While the war itself had an enormous effect on individuals, its impact on Canadian society generally was just as profound. To underscore the advances in mechanization that were a secondary result of the First World War, one part of the exhibit is dedicated to life in Ontario before the conflict. It relies heavily on images drawn from the T. Eaton Company catalogue and features a large number of artefacts, many of which were borrowed from Black Creek Pioneer Village and the Peel Art Gallery Museum and Archives. These include toys, utensils, a camera, a razor – common objects chosen for the ability of people to relate to them. Again, to immerse the visitor in the era, these items are housed in a glass case backed with an image 25 feet long by five feet high of the interior of a pre-war Eaton’s store. The First World War was a colossal affair, stupefying in terms of its scale and the numbers of participants and casualties. We wanted to reflect this through the oversized dimensions of the exhibit. But rather than being the focus, the enormity of the war becomes secondary – almost literally taking a back seat – to four impossibly small lives. Amidst the excess, the barbarity, the insanity, we sought to bring to the fore the quiet heroism of four actors. The generosity, courage and compassion that emerge from their deeds and writings amply demonstrate that no conflict, no matter what its proportions, can match the breadth and depth of the human spirit. 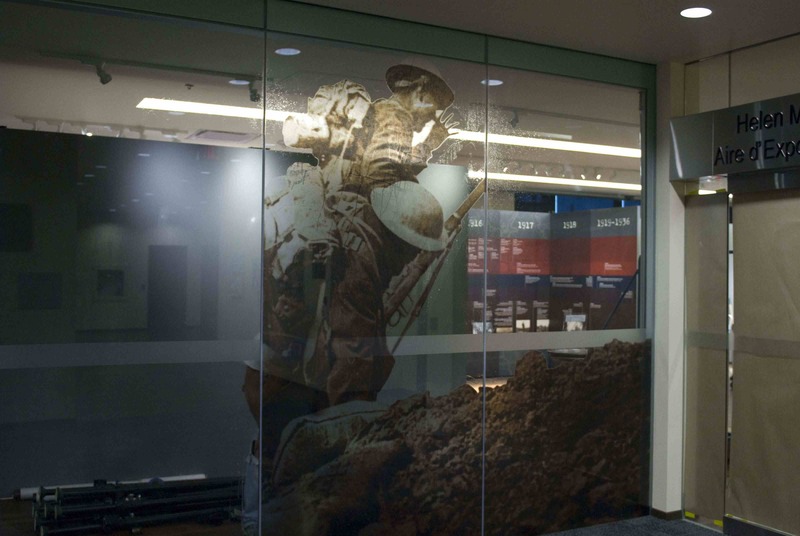 The Dear Sadie: Love, Lives, and Remembrance from Ontario’s First World War onsite exhibit runs until January 2016. The exhibit space is open from Monday to Friday from 8.30 a.m. until 5 p.m., Tuesdays and Thursdays until 8 p.m. It is open on Saturdays from 10 a.m. until 4 p.m. The Archives of Ontario is closed on Sunday and statutory holidays. Timothy Humphries oversees the Archives of Ontario’s popular travelling exhibits program.